People that are new to miniatures gaming often ask why there is a scale for miniatures and different scale for distances (Ground Scale). It would be great if the miniatures scale and ground scale were the same but in most cases this simply not practical. The problem with using a ground scale that is the same as the miniatures scale can be seen in the photo below. In this photo you see a set of game boards that belong to the author, the entire setup is made up of 18 individual boards, each one is 20” x 20”. One of the reasons 20” was chosen for the board size is because at a ground scale of 1” = 50 meters, each board is one square kilometer. If a true 1/285th scale ground scale was used it would be aprox. 7” = 50 meters. You might be thinking “what’s the problem with that?, that would be perfectly realistic”. Yes, a ground scale of 7”= 50 meters would be very realistic, but it creates real problems for the game. One problem is vehicle movement; Image you have an M1 Abrams at the far end of the table, and it’s on road movement is 1100 meters per turn. 1100 meters at a scale of 7” = 50 meters is 154 inches of movement per turn or almost 13 feet. This means that an M-1 could move from one end of the table to the other end of the table in one game turn. 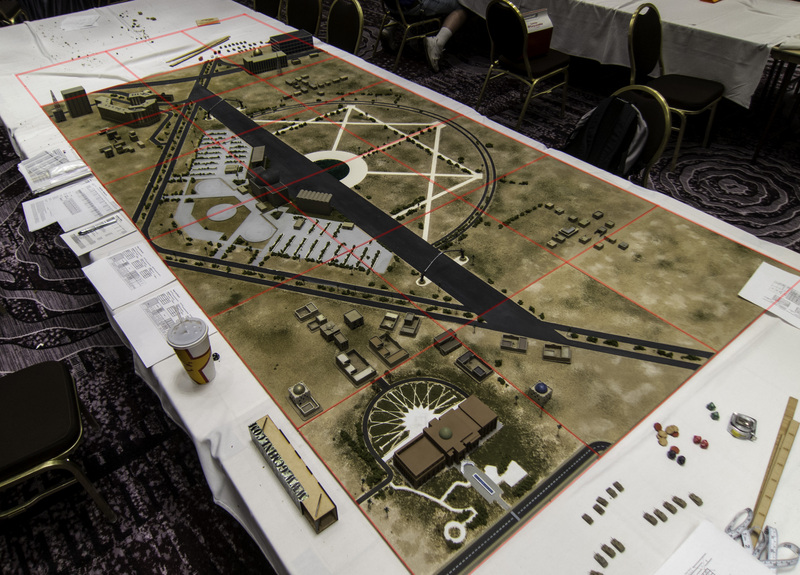 The other problem is firing ranges, at a true 1/285th scale ground scale, a 50 caliber machine gun could cover the entire table, and larger guns could cover two or three table lengths. If you had that sort of space to play a game that would be great, but most people do not have that much space. So, the compromise is a smaller ground scale. With a 1 = 50 meters scale, that same M-1 moves about one individual board length per turn instead of the entire table length, and it can fire just over 3 board lengths rather than across multiple tables. So, this is why we use ground scales that a significantly smaller than the miniatures scale .. it just makes the game more playable. It’s worth noting that in small skirmish games that involve only infantry and are played at larger scales like 15mm, 20mm, or 28mm quite often they are played at a ground scale that is equal or very close to the miniatures scale. In armor games, especially modern armor where vehicle speeds are high and gun ranges are very long this is simply not an option. This entry was posted in Game Play, Other Random Stuff and tagged Game Play, Ground Scale, Miniatures Scale by Allen. Bookmark the permalink. This is easily one of my favourite boards – anywhere! Well done (again!) Allen.